The gains in health care coverage and access to care made under the Affordable Care Act have fundamentally changed the health insurance system. But reaching the millions of adults who still remain without coverage is one big remaining challenge. Another is ensuring that those who are insured can afford their health plans and their health care. 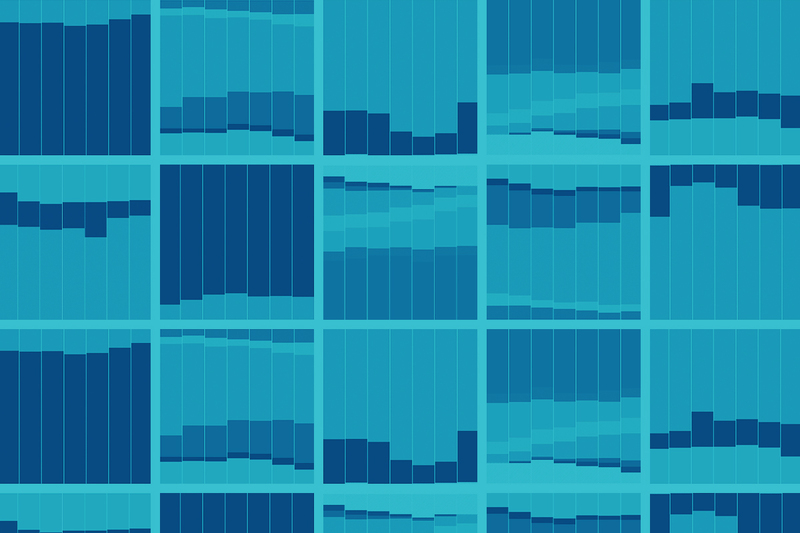 Explore and slice 13 years of health insurance data—any way you like. Author Abrams, Melinda K.Alteras, TanyaAndersen, MartinAndrews, JulieAnsari-Thomas, ZohraArensmeyer, JohnArio, JoelArnold, Daniel R.Arora, AnupamaBachrach, DeborahBailit, Michael H.Baker, JoeBangit, ElizaBeckerman, J. ZoëBerenson, JuliaBerwick, DonBeutel, SophieBhupal, Herman K.Bishop, ShawnBlack, MorganBlendon, Robert J.Blumberg, Linda J.Blumenthal, M.D., DavidBorja, AnaïsBovbjerg, Randall R.Bradley, Elizabeth H.Brantley, ErinBriesacher, BeckyBrooks-LaSure, ChiquitaBrouwer, WernerBruen, BrianBuettgens, MatthewButtorff, ChristineCall, AdrienneChakraborty, OugniChase, DavidChen, Lanhee J.Chollet, DeborahChoudhry, Niteesh K.Claypool, HenryColeman, AkeiisaCollins, Sara R.Colmers, JohnConnor, KaylaCordova, Amado Corlette, SabrinaCraig, John E.Cunningham, Peter J.Curran, EmilyCusano, DavidDash, Sarah J.Davenport, KarenDavis, Hailey E.Davis, KarenDermody, CaraDesRoches, Catherine M.Desai, SheilaDitsler, ElaineDobson, AllenDorley, MarkDorn, StanDoty, Michelle M.Edwards, Jennifer N.Eibner, ChristineEpstein, Arnold M.Fairbrother, GerryFerris, Timothy G.Ferry, DanielleFisher, Elliott S.Fisher, PeterFrank, Richard G.Fronstin, PaulFry, CarrieFryer, Ashley-KayFulton, Brent D.Fund, The CommonwealthGabel, Jon R.Garber, TracyGarcia Mosqueira, AdrianGardiner, TerryGaudette, TimGauthier, AnneGiovannelli, JustinGlied, Sherry A.Goe, ChristinaGoggin-Callahan, DougGoldman, Anna L.Gordon, ColinGould, DouglasGould, EliseGourevitch, RebeccaGradison, BillGrady, AprilGreen, Matthew Gruber, JonathanGunja, Munira Z.Gunsalus, RachelGuterman, StuartGuyer, JocelynHaase, Leif WellingtonHale, StephaineHall, Jean P.Hall, Mark A.Haran, ChristineHargreaves, DougalHasstedt, KinseyHaught, RandyHawkins, SamanthaHayes, Susan L.Ho, AliceHoadley, JackHolahan, JohnHolla, NikhilHolmgren, Alyssa L.Homer, Charles J.Hong, Clemens S.Hoo, EmmaHostetter, MarthaHow, Sabrina K. H.Hurt, Carla Jackson, AdlanJones, ShyloeJost, Timothy S.Kahn III, Charles N.Kane, Nancy M.Keith, KatieKim, Minah K.Kiszla, JordanKlein, SarahKofman, MilaKolber, MichaelKona, MaanasaKriss, Jennifer L.Ku, LeightonKutyla, ToddLambrew, Jeanne M.Lansky, DavidLauerman, WileyLerche, JuliaLeu, Robert E.Lewis, CorinneLibster, JenniferLippa, JacobLiu, JodiLivermore, GinaLong, Sharon K.Lopez, NancyLore, RyanLucia, KevinLuu, Phap-HoaMa, StephanieMacri, JulianaMahato, BisundevMann, CindyMatter, PiusMaylone, BethanyMcCarthy, DouglasMcCue, Michael J.McDevitt, Roland D. McGuire, Thomas G.Mehta, DeviMerlis, MarkMeyer, JackMika, StephanieMinyard, Karen J.Miskell, SeanMonahan, ChristineMongan, James J.Moore, JaniceMorone, James A.Morris, RebeccaMoulds, DonaldNguyen, KevinNobari, Tabashir Z. Nowak, SarahNuzum, RachelOran, RebeccaOrav, E. JohnOrris, AllisonOsborn, RobinPalanker, DaniaParikh, ShivaniPatchias, ElizabethPerry, IanPerry, MichaelPervez, FouadPeugh, JordonPickreign, Jeremy D.Pillai, DrishtiPollitz, KarenPourat, NaderehQuincy, LynnRadley, David C.Rao, PreethiRasmussen, Petra W. Remler, DahliaRiley, M.D., PamelaRobertson, RuthRobinson, James C.Rodgers, MichaelRosenbaum, SaraRoski, JoachimRothenberg, SaraRusso, ThereseRustgi, SheilaRutschi, ChristianRutten, Frans F. H.Ryan, JamieSaltzman, EvanSarnak, Dana O.Scheffler, Richard M.Schilling, BrianSchmucker, SaraSchneider, M.D., Eric C.Schoen, CathySchoenbaum, Stephen C.Schor, Edward L.Schwab, RachelSeervai, ShanoorSen, Aditi P.Seshamani, MeenaShah, ArnavShah, TanyaShea, KatherineShih, AnthonyShort, Pamela FarleySilow-Carroll, SharonSimpson, LisaSmith, JennieSnowden, SaraSolís-Román, ClaudiaSommers, Benjamin D.Somodevilla, AlexanderSquires, DavidStapleton, DavidSteinmetz, ErikaStremikis, KristofStriar, AdamStromberg, SamStuart, BruceSummer, LauraSwartz, KatherineThomas, AmyTikkanen, RoosaTorres, Jacqueline M.Turnbull, Nancy C.Velasquez, MariaVolk, JoAnnWachino, VikkiWallace, Steven P.Waxman, JudyWeinbaum, IlanaWeinberg, MicahWeinstein, Daniel S.Whaley, ChristopherWhite, ChapinWhitmore, HeidiWilliams, AshleyZezza, Mark A. The Administration Tried to Make It Easier for States to Waive ACA Rules: Will Any Take the Plunge? What is the current status of ACA innovation waivers for each state?